You are happily driving along when you hear the gut-wrenching sound of rubber flapping against the road. You have a flat tire! You pull over to a safe location and asses the damage. Looks like your front tire found a friendly screw and the puncture has caused your tire to go flat. What do you do? If you have cell phone reception, you can call for roadside repair to help you change your tire. It typically takes an average of 45 minutes for assistance to arrive, leaving you stranded in the elements on the unsafe side of the road. Depending on your situation, it can also be an expensive solution to your flat tire emergency. Alternatively, you can try to swap out your flat tire with a spare tire. The first thing you should consider is if you know how to change a flat tire. Watching instructional YouTube videos while struggling with a car jack as cars speed right by you on the interstate is not the best situation. Additionally, because spare tires sit in trunks unused for long periods of time, they can be underinflated (and unusable) when you pull them out. 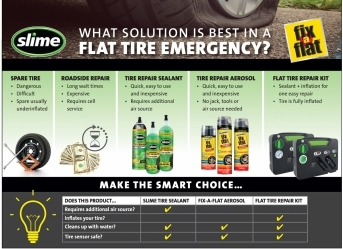 The smart choice when faced with a flat tire emergency is to reach for your tire sealant or your flat tire repair kit. Affordable and easy to use, tire sealants are designed to get you back on the road quickly! Which option do you prefer? 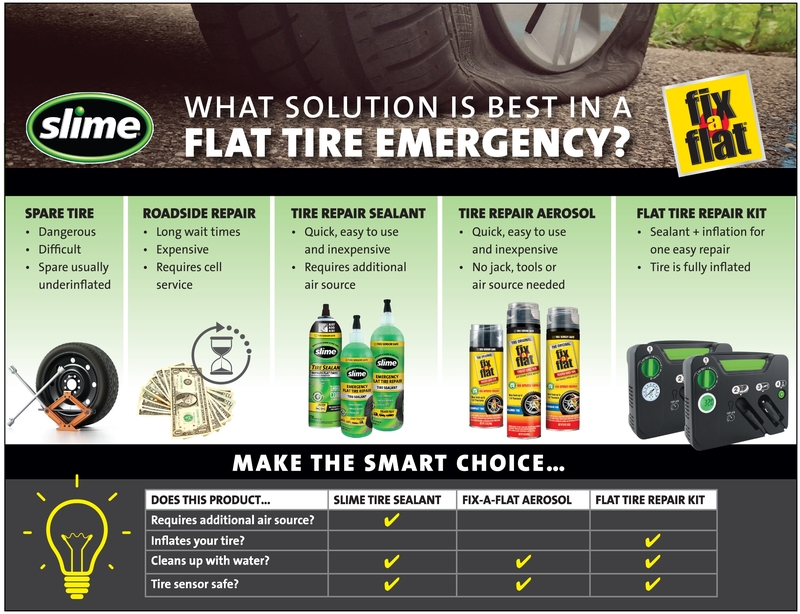 Slime's Emergency Tire Sealant (yellow label) is designed for use on highway vehicles experiencing a flat tire emergency. Slime’s tire sealants coat the inside of the tire so when the tire is punctured, the escaping air carries the sealant to the puncture. The liquid portion of the sealant escapes and the fibers and binders build-up and intertwine to form a flexible plug. It seals punctures up to ¼” instantly so you can quickly and safely get your vehicle back on the road and off to a tire repair station. While the cheapest solution to a flat tire emergency, a repair with tire sealant requires a tire inflator to fully inflate the tire after the sealant is injected. Most new cars today don't come with a spare tire. They come with a Flat Tire Repair Kit. Flat tire repair kits are a quick and easy way to repair a flat tire in an emergency. They come with two important components: tire repair sealant and a tire inflator. In just a few simple steps, you insert the tire sealant and then air up the tire and get on your way. Though flat tire repair kits are more expensive than just the tire sealants mentioned above, these kits include the necessary tire inflator and are the easiest to use. Wondering which solution is best for you? Check out this emergency flat tire infographic to compare the pros and cons of all the solutions on the market (Click to enlarge).